a pair of handprinted aquatint etchings with softground, the measurments are for each print. Feathers are amazing things, able to hold a bird aloft, and so exquisitely beautiful to look at! Birds are a never ending source of inspiration for me, the do represent freedom in most of my work. This is a handprinted aquatint etching; I ink up the copperplate for each print pulled, this means that each print will have small differences to the next. I hope you treasure this as a sign of individuality and part of what makes an original print an original. I use first class papers and ink to give my work the best possible longevity. I can add the dot, that here is in turquoise, in a color of your choice, just talk to me! Aqautint is a technique where deep tones can be achieved on an etching, it involves rosin, that gets melted onto the copperplate with the help of a burner. 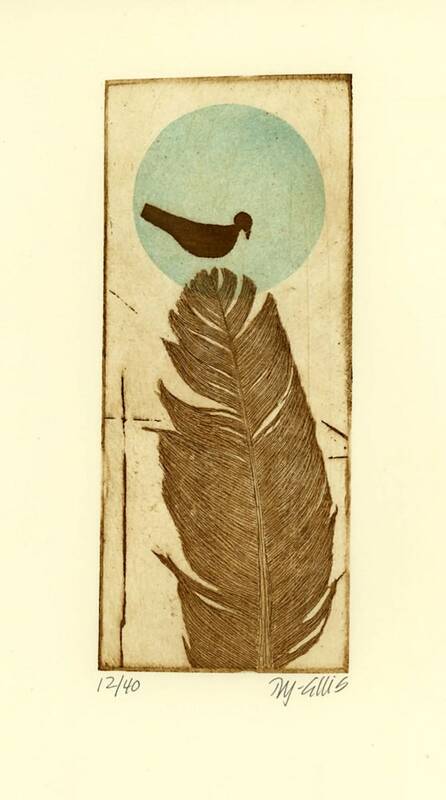 If you would like to see me make and print an etching, go to www.youtube.com and search under my name, I have a lot of printmaking films there. 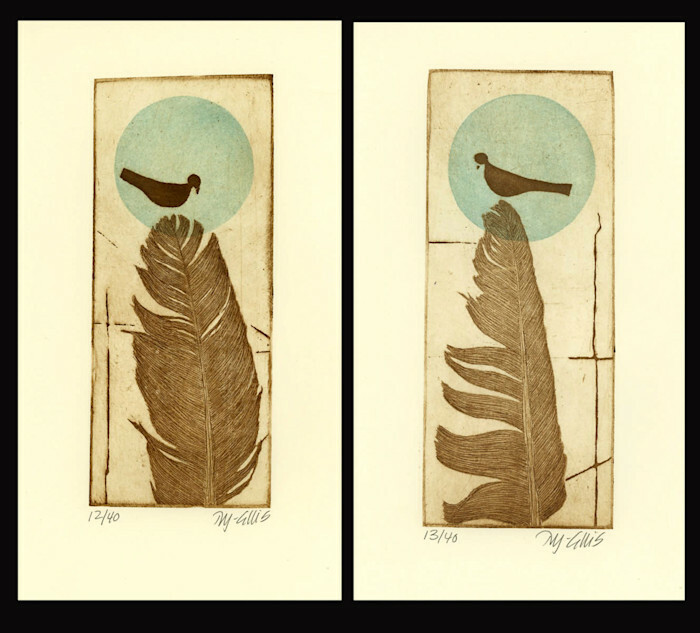 "Birds of a Feather" are printed on a piece of warm cream heavy printmaking paper, perfect for the image, the paper measures 8" x 12" (21cm x 30 cm A4) and the actual image measures on each copper plate 3" x 7". (8 cm x 18 cm). The prints are on separate pieces of paper. I'll mail your etchings protected by tissue paper and cellophane and it comes with a nice "Original Print by Mariann Johansen-Ellis" sticker and a leaflet explaining what an etching is. 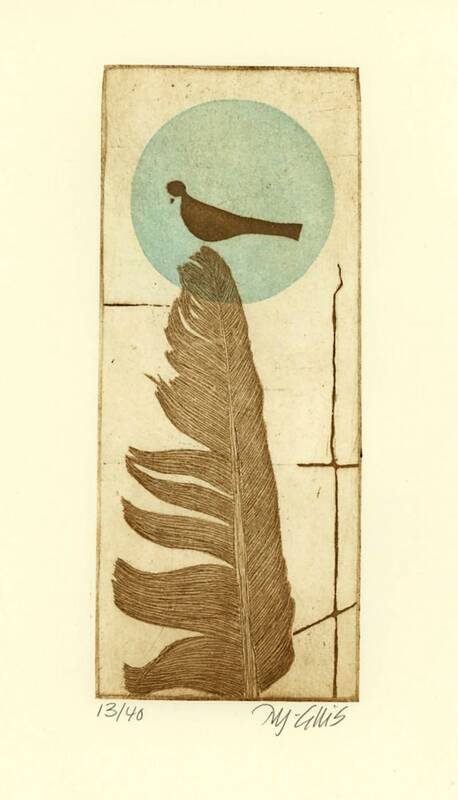 If you are giving the etchings away as a gift, let me know and I'll wrap it in a pretty piece of paper for you!